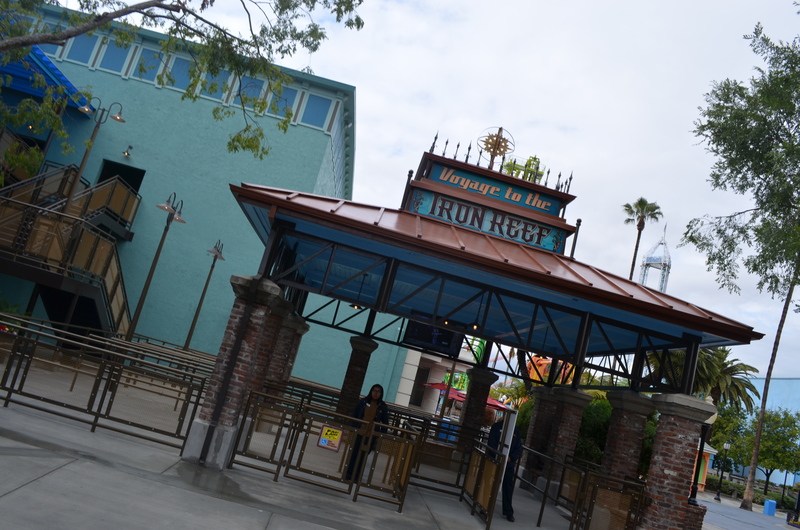 Knott’s Berry Farm has added yet another new attraction for the third year in row. 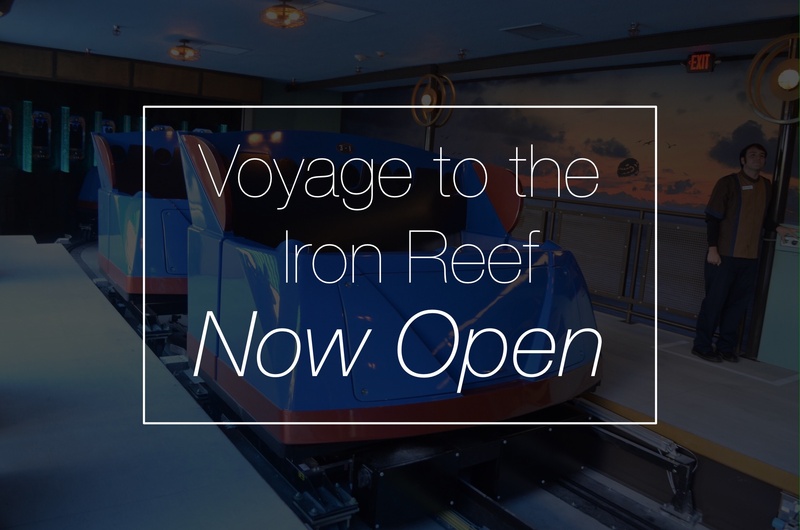 Voyage to the Iron Reef is their newest. 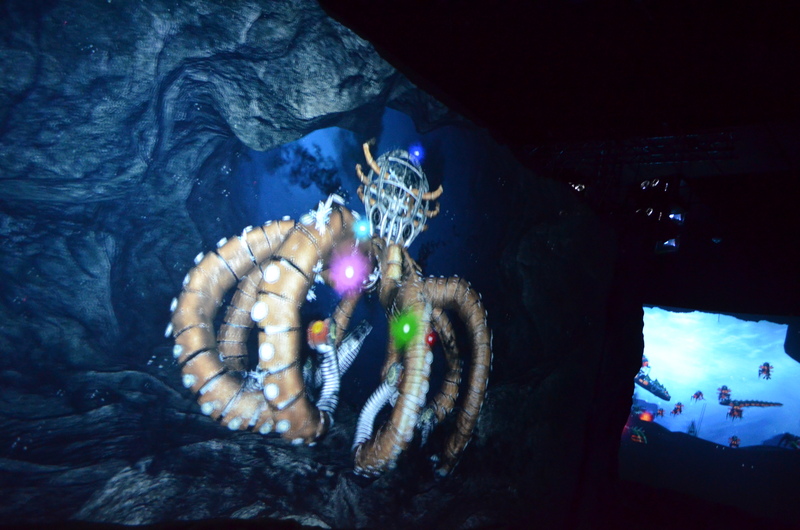 The interactive, media based dark ride takes riders to the ocean floor to destroy an aquatic army that is feeding off of the park’s coasters. 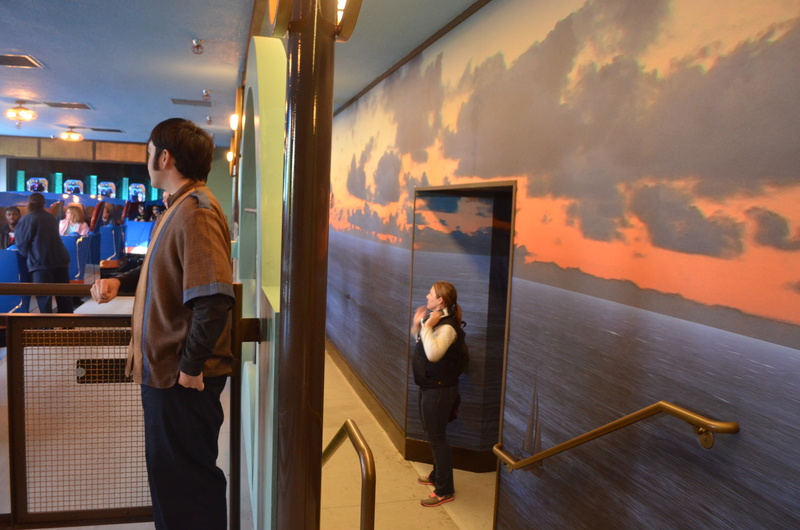 The ride features 11 screens from 20 to 70 feet long. 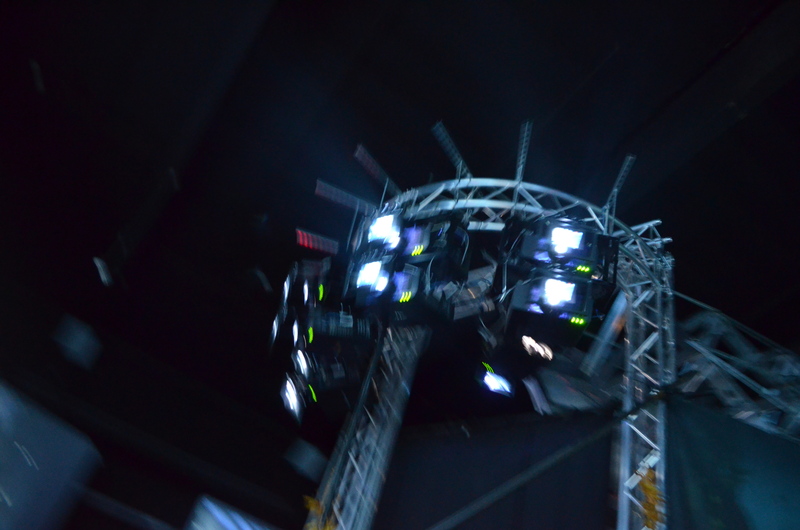 There is a total of 44 1080p HD projectors that help create the 3D realm. 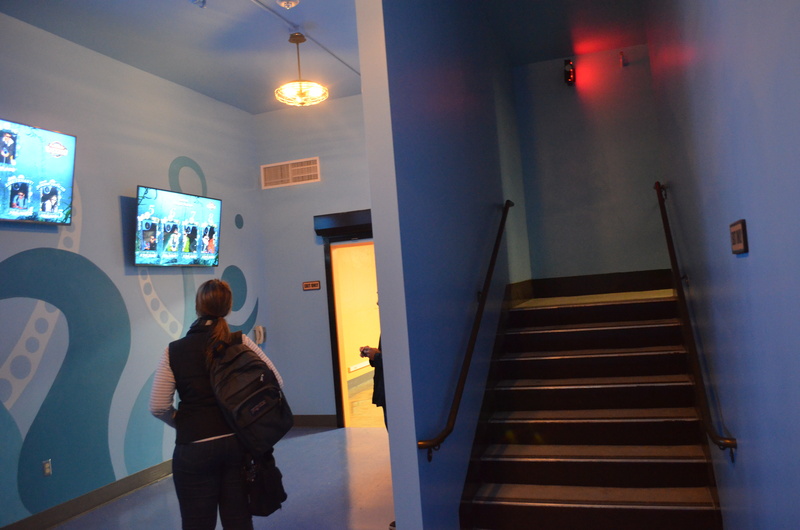 The ride is located on the second floor of a forty year old show building. 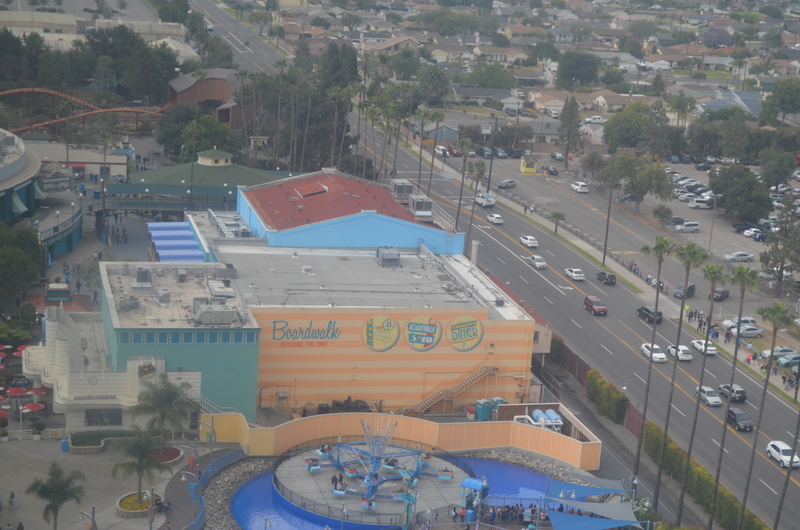 This location has been home to two other dark rides, Knott’s Bear-y Tales (1975) and Kingdom of the Dinosaurs (1986). The latter was a quick, prehistoric remodel of Bear-y Tales and used the same ride layout. Kingdom of the Dinosaurs closed for good in 2004 and the building sat empty until now. 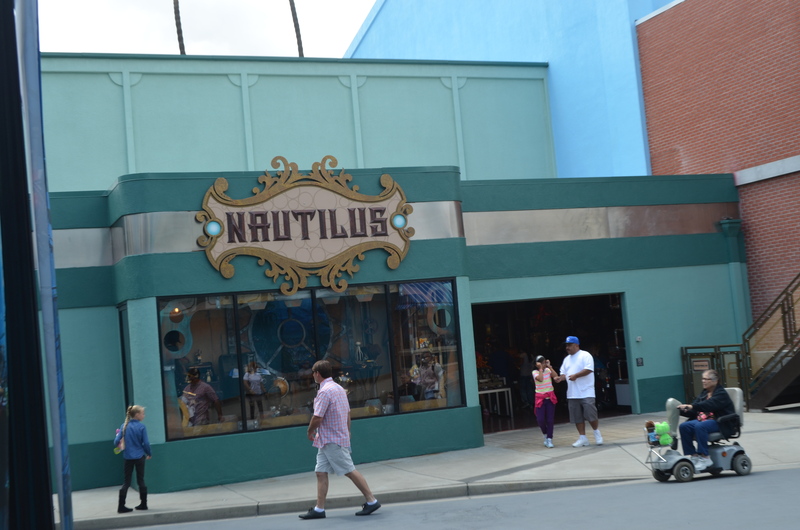 Here are some before and after photos of the facade and show building. June 2014 May 2015 June 2014 May 2015 Iron Reef was built by Canada based Triotech, the same group behind Wonder Mountain’s Guardian, their first project. 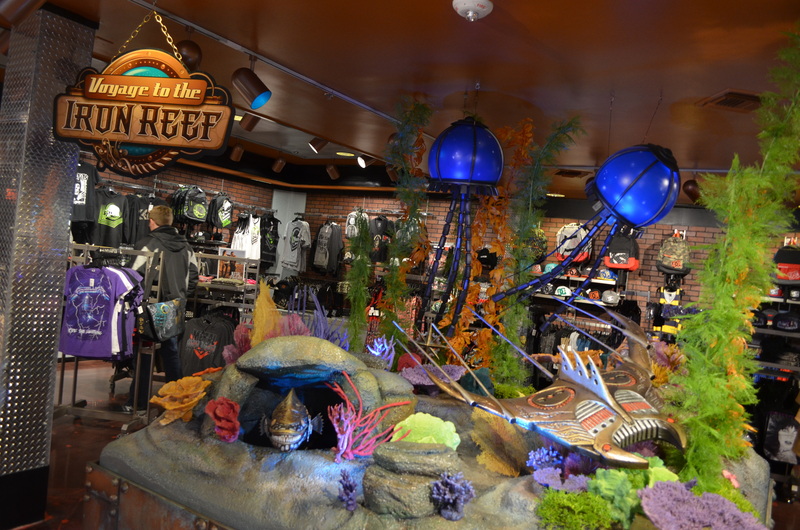 It is very clear after riding Iron Reef that they learned a lot after Guardian. 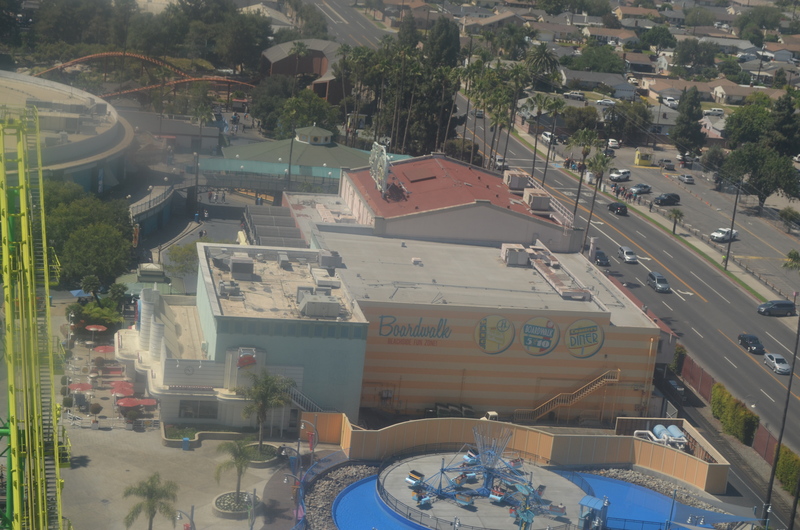 Instead of there being a coaster section, they focused completely on the dark ride aspect. There are also physical sets, bridging the blank gap between screens. 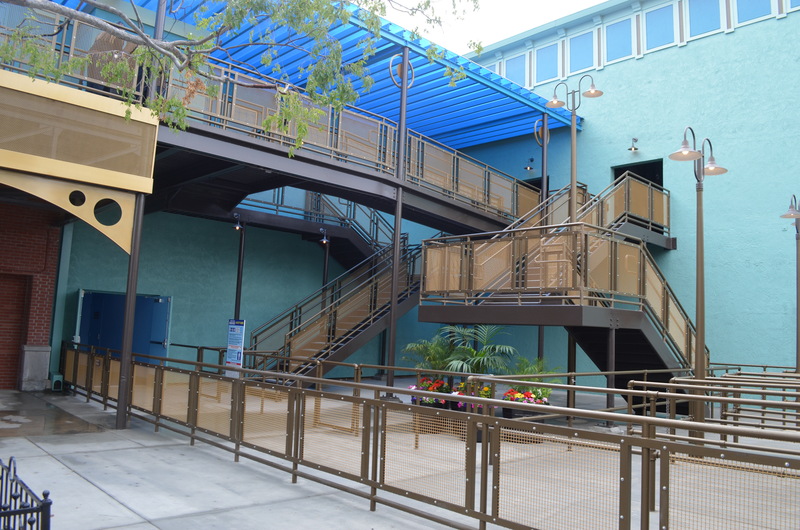 Iron Reef features an outdoor queue and a staircase that leads to the upstairs indoor queue with the ride’s preshow. 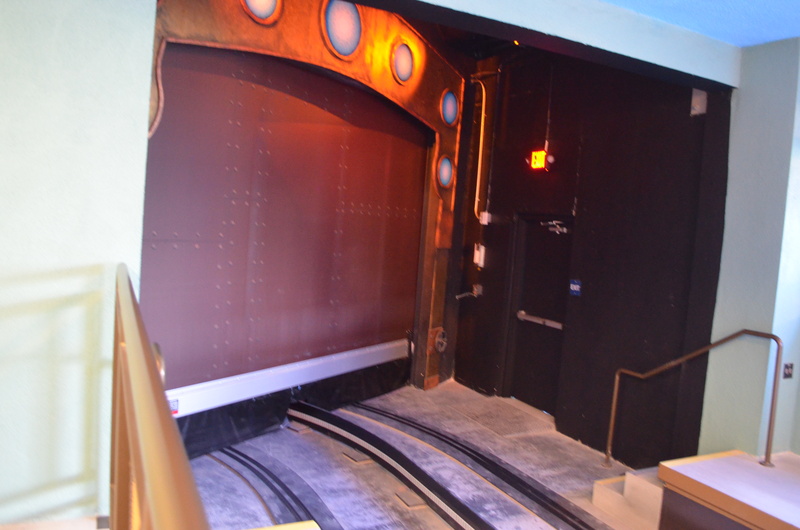 From here, you walk across a ramp to the large platform with a small queue, receive your 3D glasses, then board the ride vehicles. 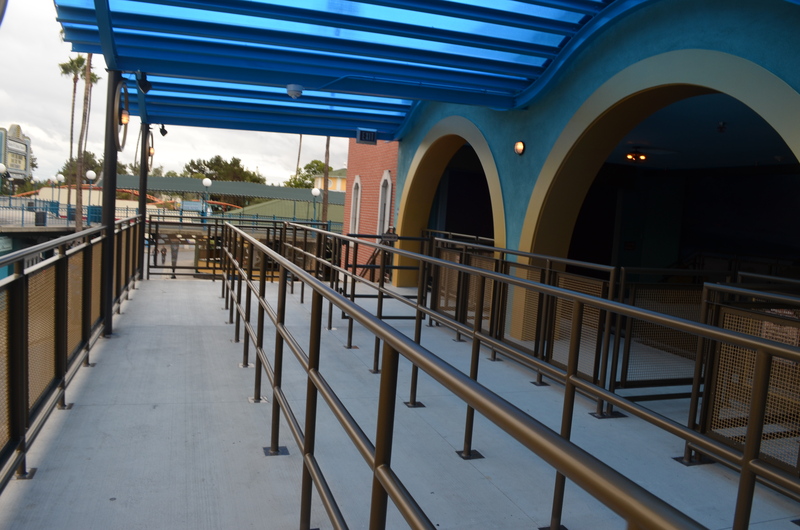 There is a separate staircase for Fast Lane users, but unfortunately there is no single rider line as of now. 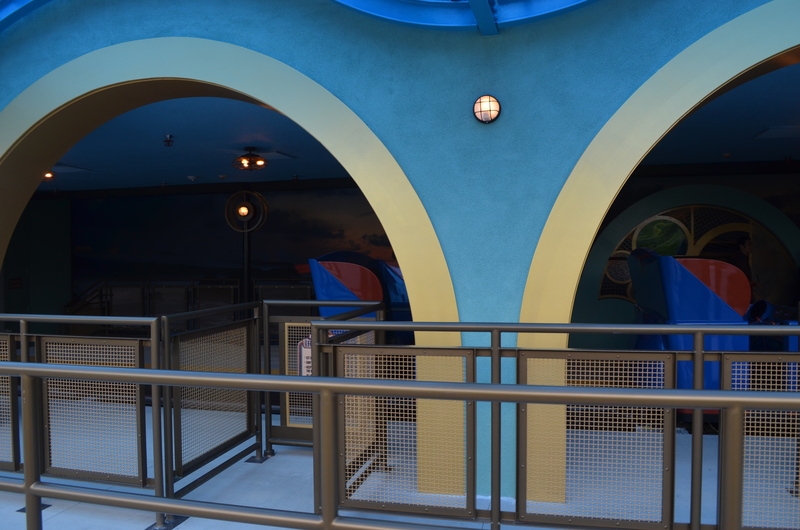 The loading platform is enclosed with four beautiful arches and a new mural at the back end. The submarined themed ride vehicles are very unique. 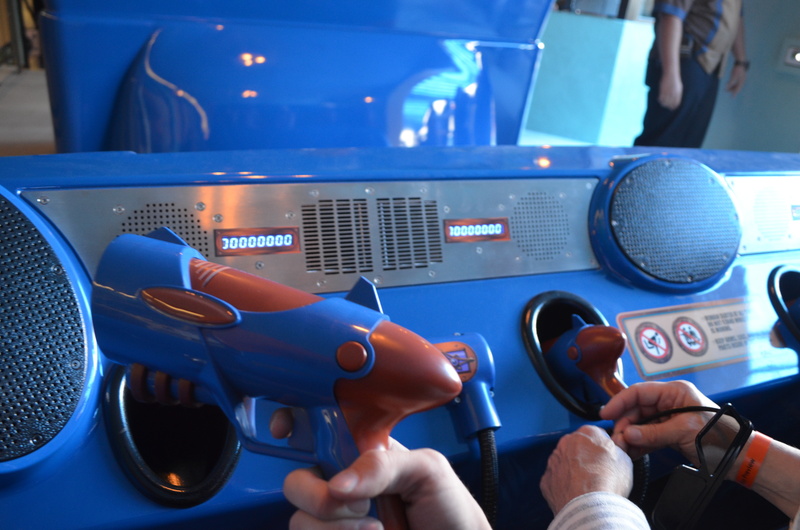 Each rider has a blaster and have a different color pop up on the screen when they are firing. 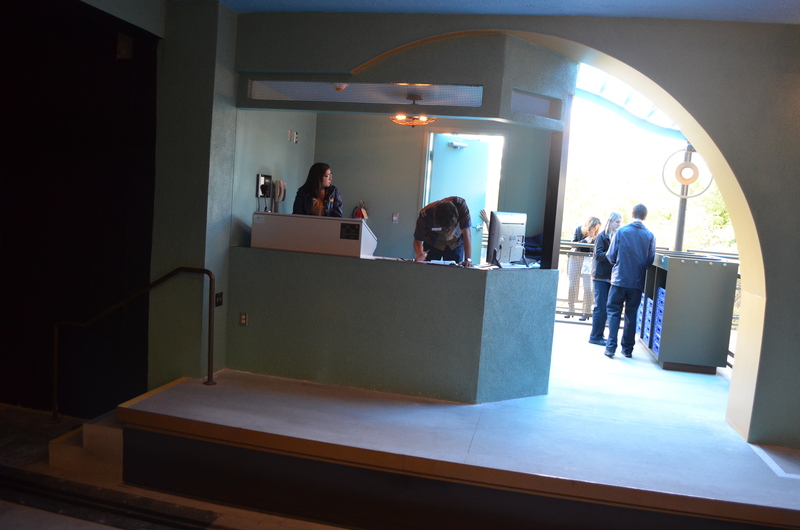 The front half slides forward to allow guests to enter. 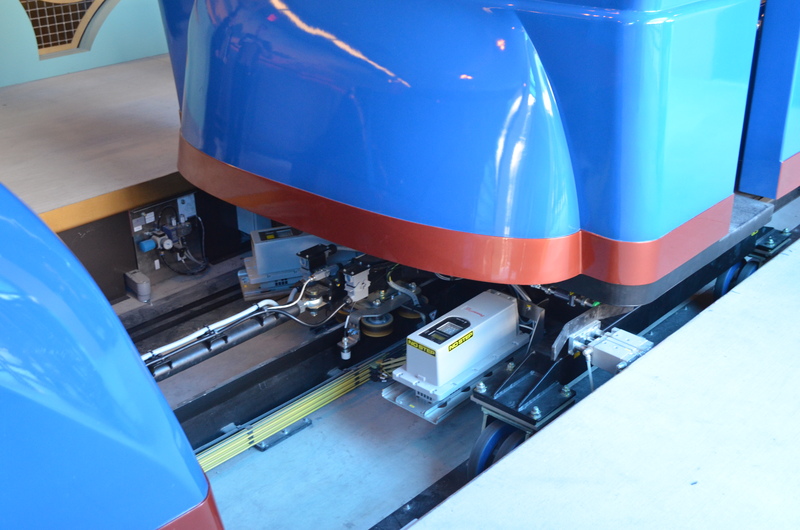 The cars also feature 360˚ spinning to allow the cars to face the screens. Each car seats four and there are two cars in a train, with a total of eight trains. The ride has a maximum capacity of 800 people per hour, more on this in a bit. From here, the train rolls forward and a speed door rolls up. We enter the first scene, a large boiler and fan are on both sides. Another door opens up and we meet the first screen. There are gears behind us and set the scene of being in lift. The animation depicts the vehicle diving under the water. We rotate and now face a fog curtain with a cool effect of use underwater. The first scene plays out a small screen, but the animation gives the illusion that we are constantly moving. 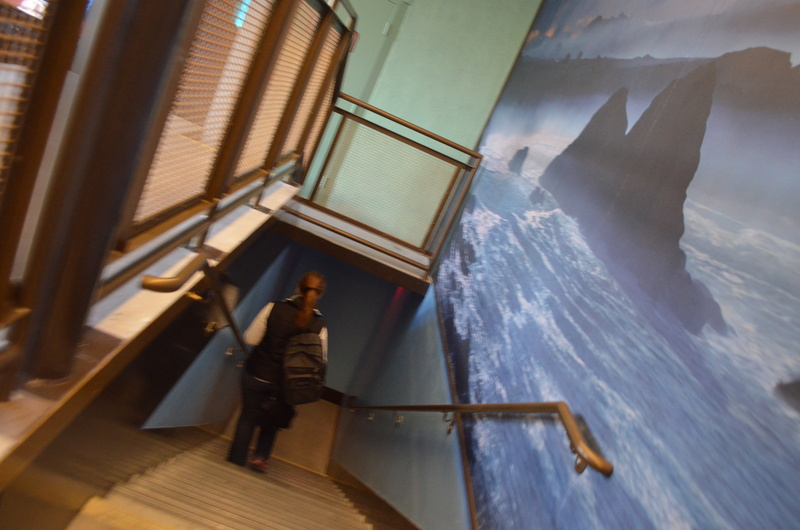 Another mural is behind us and rock work is used to connect most of the screens. 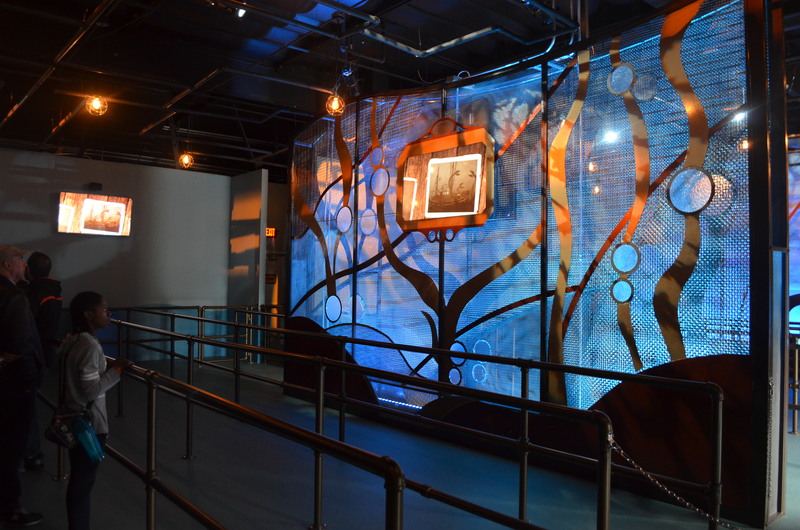 Each screens has steampunk creatures, and you need to shoot at them with your blaster. The blasters use a small camera to detect the sensors located behind the screen. The next few screens have more and more creatures and even some easter eggs, such as the old ‘Roaring 20’s’ sign and others. 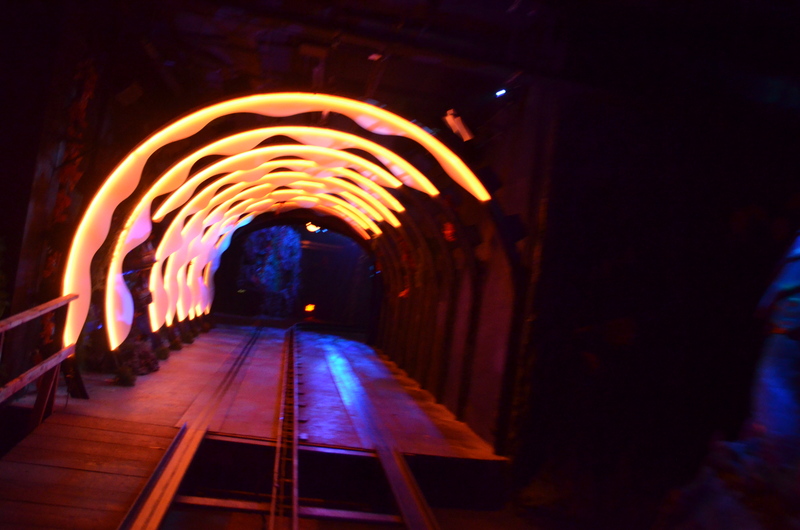 You travel down a tunnel, the insides of a steampunk fish, with LED lighting and an animated eel figure. 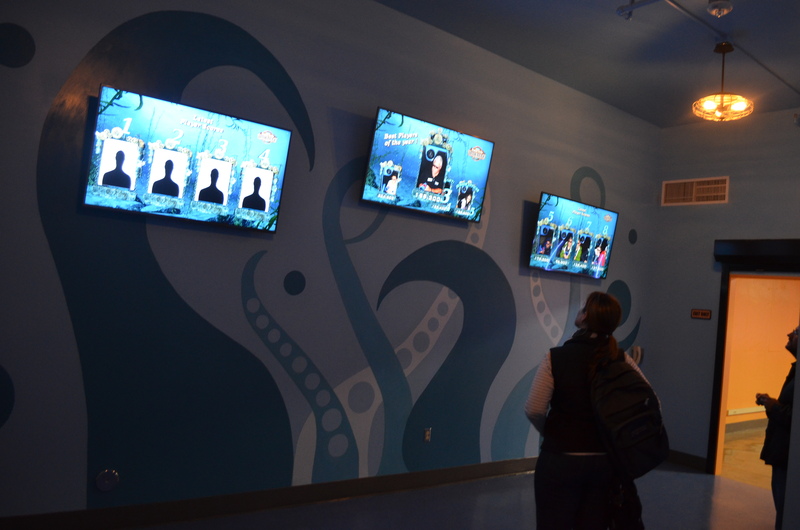 The next screens take place inside the Kraken Queen’s lair. 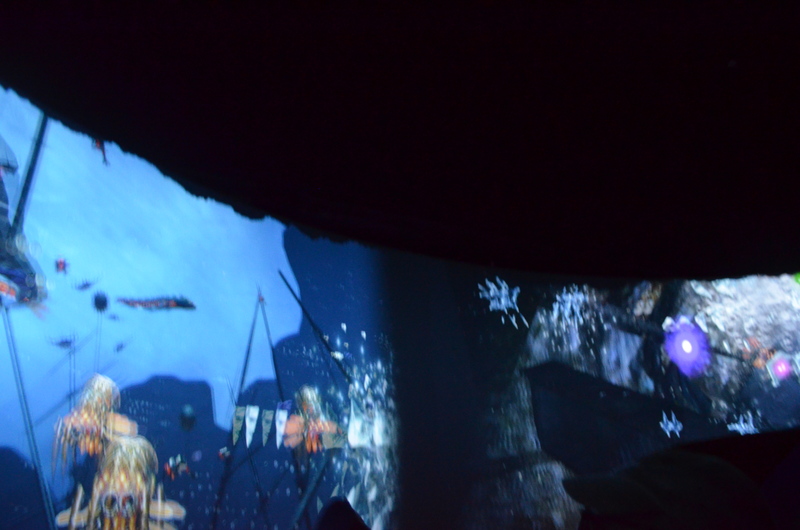 A large sunken ship set piece is here connecting two screens. A large seventy foot wrap around screen leads to the finale. You vehicle faces the queen flying out at you and your vehicle spins around to face a massive concave screen. This screen wraps above you as you have a final face off with the villain until she is defeated. 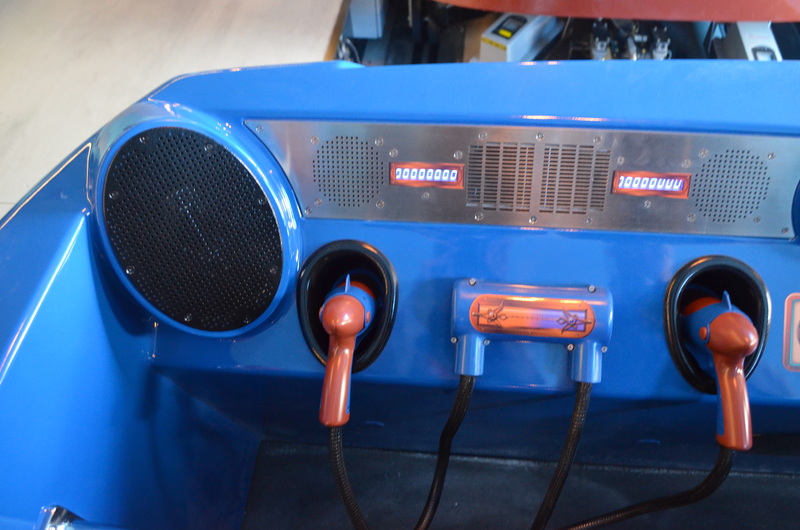 Your cars pass the track switch that leads to the maintenance shops, and now pass through another speed door and can see everyone’s score along with an on ride picture. 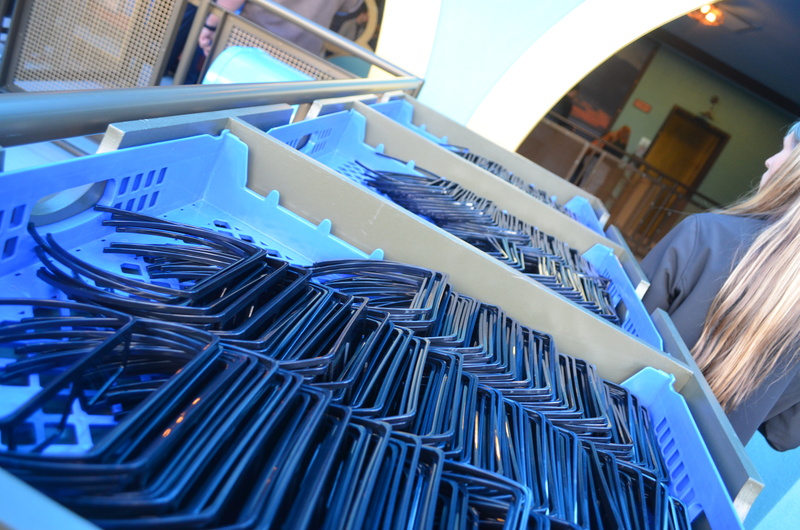 Your car rolls back at the unload platform and return your 3D glasses and descend another series of stairs and view monitors with the top scores of the day. 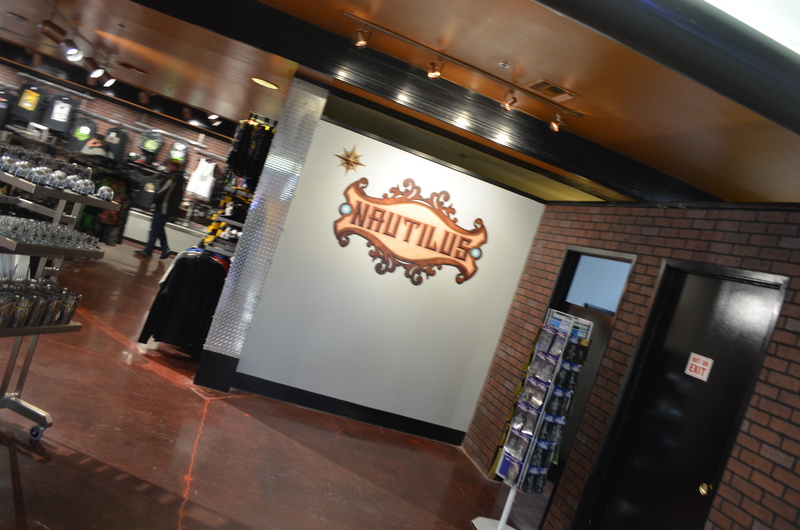 You exit into the park’s newly remodeled arcade and have the option to go into the ride’s gift show named Nautilus. 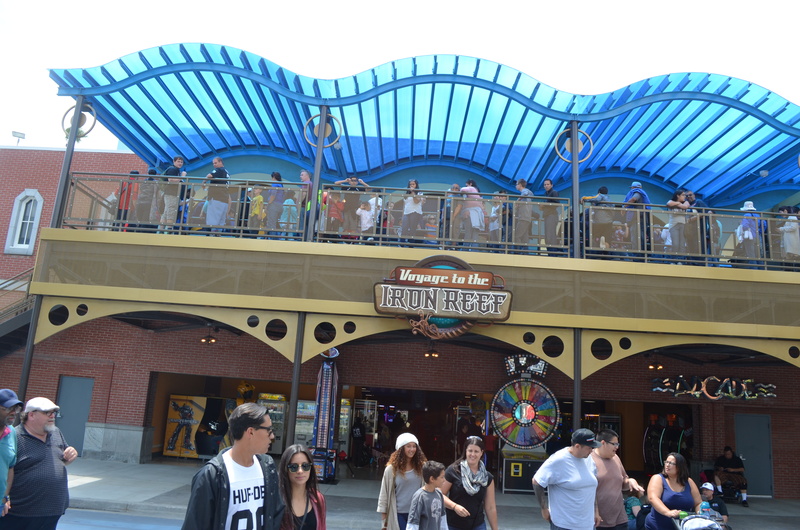 The ride new facade is gorgeous and features a translucent covering on the outdoor deck. 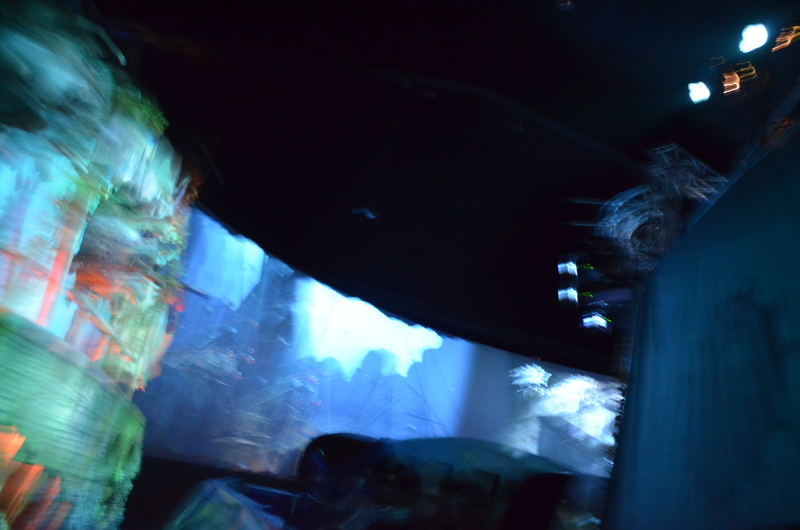 I personally prefer dark rides filled with practical effects and animatronics creating a passage experience. But I honestly thought this was a fun ride and wanted to go on it again right when I got off. 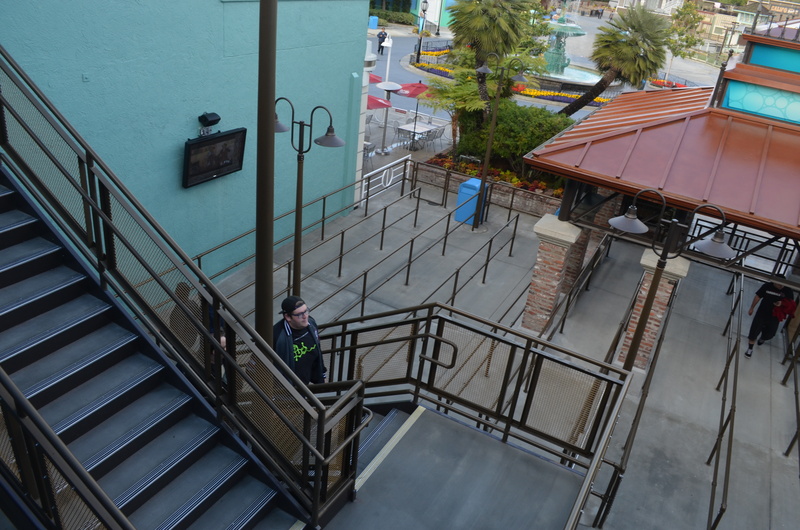 The backstory is something most guests wont fully understand before they ride, but isn’t necessary to enjoy the ride. The media quality and the gameplay were both good. 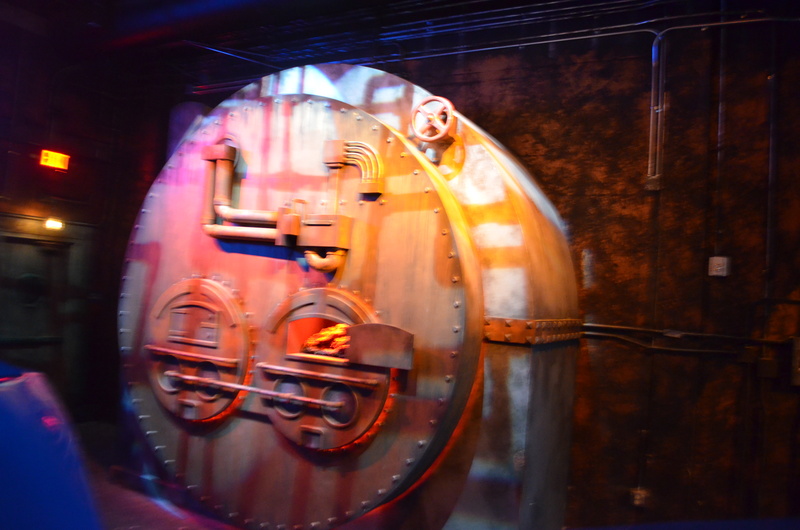 The sets were great to see and helps make the ride immersive and not fell like you are riding in a warehouse. 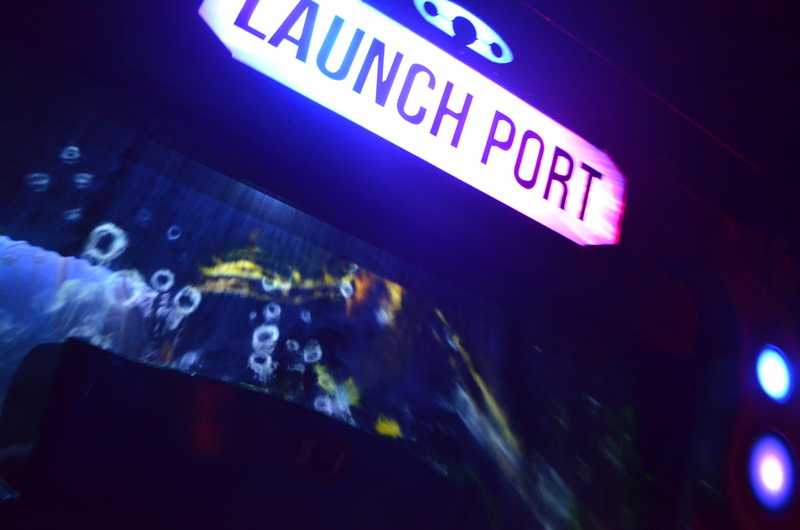 One good analogy I was told is the Justice League dark rides at Six Flags parks are dark rides with a gaming feature, while Iron Reef is a game on a track. 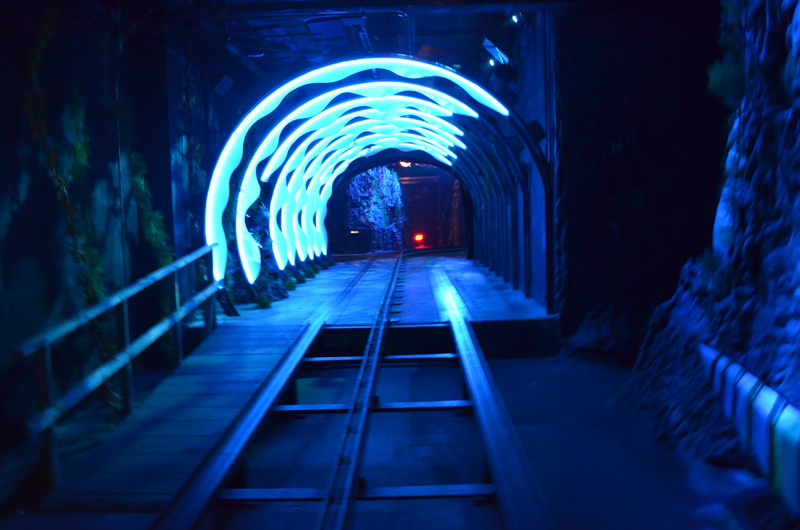 One thing I think too, Sally dark ride makes dark rides and Triotech makes video games, so the difference is easy to spot. 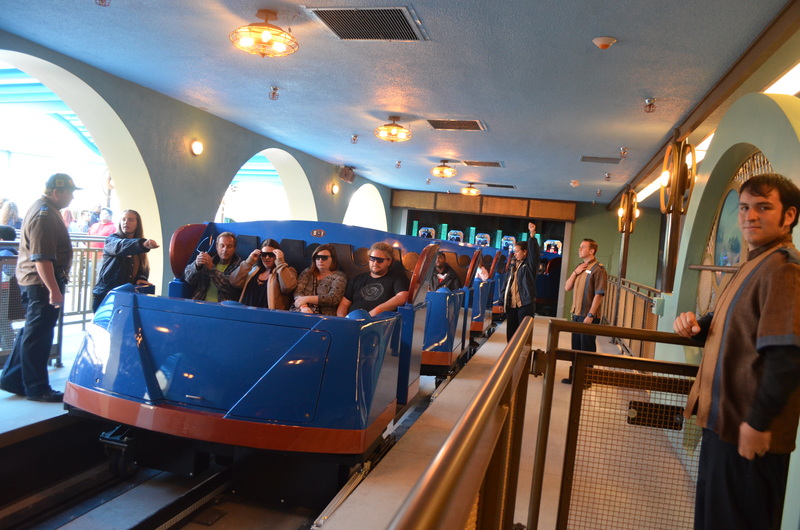 The ride system’s loading and upload operations are very bizarre and doesn’t help with the attraction’s low capacity. The capacity is my only issue with the ride, but unfortunately would be very difficult to fix. 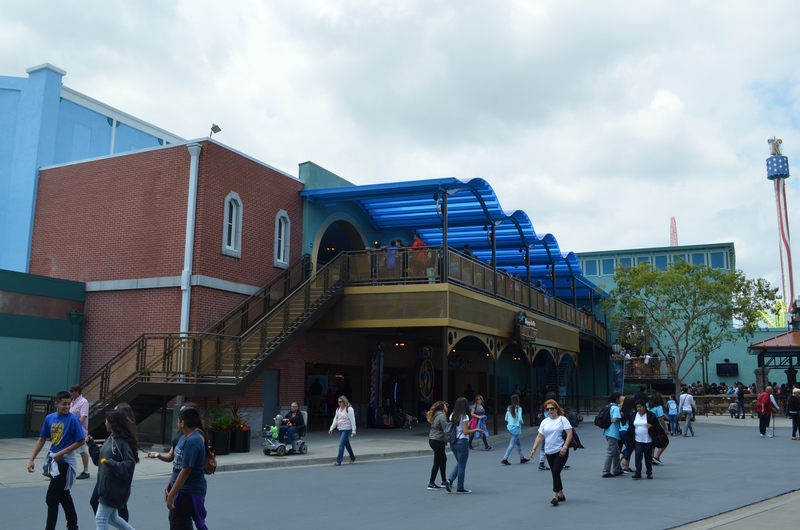 It would be great to see them add a single rider line in the near future too. I came off the ride very impressed and enjoyed the ride. 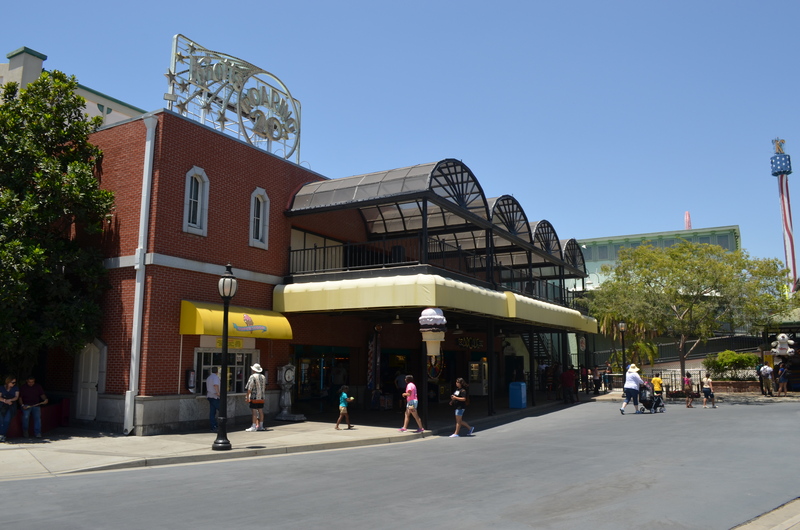 It is sure to be a huge hit this summer with Knott’s Berry Farm. This, in my opinion, is the best interactive ride I have ever been on and can’t wait to see what comes next from both Knott’s and Triotech.